The Siberian Ecological Center (Sib-Eco Center) is a lively and highly motivated environmental NGO based in Siberia, Novosibirsk. This is where I am currently volunteering as an ‘Eco Warrior’ whilst also studying part time at the university. First let me divulge a little about the Siberian Ecological Center and Akademgorodok (the suburb where we are based). The name Akademgorodok literally translates as ‘Academic Town’ and is blessed with a very exceptional spirit. Its uniqueness stems from the fact that it originated as a cluster of scientific faculties which were virtually built into the forest outside Novosibirsk. T h i s c o m b i n a t i o n g i v e s Akademgorodok a distinctive affinity with nature and a fascinating intellectual ambiance. Towering pine and silver birch trees fill every space unoccupied by buildings or roads and wild squirrels frequently scuttle to and fro between the trees, almost oblivious to the presence of passers by. Novosibirsk State University’s main campus is situated in amongst the forest in Akademgorodok and the area is bustling with active and studious young people. Perhaps these are the reasons why the Sib-Eco Center enjoys such boundless support from local volunteers and students. Our recent activities have been very exciting: there has been a race against nature to plant trees and clear illegal dumps as fast as possible before the winter snow puts a stop to all activities. But the snow has arrived and will now cover the ground until spring, hiding some of the more drastic waste disposal problems facing Novosibirsk. So for the duration of winter our attention turns to education, something which the SibEco Center considers to be the key to sustainable development. The main drive of our winter activities is to educate the youth of Novosibirsk about their surrounding natural environment. Our projects range from taking children out into nature on trips to familiarise them with their local ecosystems, to going into schools and giving presentations on both global and local ecological issues. One of our big projects this winter will be to support a local school in becoming an official Eco School. The Eco School programme was devised by the Foundation for Environmental Education (FEE) and is a world-wide programme. It is devised to be selfsustaining and self-propelling, gaining momentum as it seeks to engage and empower the whole of society. The end product of an Eco School is not just an environmentally sustainable school; the whole process strengthens relationships with local society and also with the local environment. We hope to begin this process this winter and lay the foundations for further development to raise a generation of environmentally aware children. With regard to future projects, our primary objective is to develop an ecological centre in surrounding forest land owned by the Sib-Eco Center. The centre will be a place for education, focusing on renewable energy, ecotourism and a site for the annual forest summer camp. The project already has a keen architect willing to take on the challenge and, of course, several energetic and extremely active workers and volunteers are already on the case. We are currently seeking funding for the construction and the project is fast gaining momentum. We hope that by the summer plans will be finalised and a basic temporary camp will be constructed, with nature trails around the forest and information regarding the environment – both local and global. Investigations regarding a local oil leak continue and the Sib-Eco Center is striving to apply some gentle but constant civic pressure to the company at fault (Transneft). In particular we are campaigning to ensure that the company foots the bill to clear the spilt oil and minimise both the colossal damage to the natural environment and the risk of further leaks. We are also seeking to spread awareness generally of this issue amongst what is a fairly uninformed local population. Whether this will be successful or not is still unclear, work is hindered by a lack of interest and concern from both the government and Transneft and also a lack of awareness and understanding among the local population. Our latest news is somewhat brighter, the Greenpeace Living Tree Stump visited Novosibirsk, dancing in the street, spreading awareness about illegal logging and forest fires. He was very well received and clips of his antics are available on you tube and on the Greenpeace website – well worth a look! 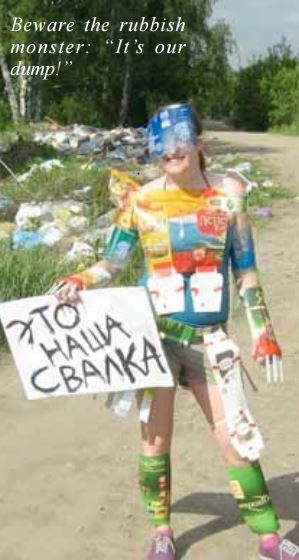 This entry was posted in Russia, Siberia and tagged eco warrior, environmental education, nature trails, Novosibirsk, Russia, Siberia. Bookmark the permalink.